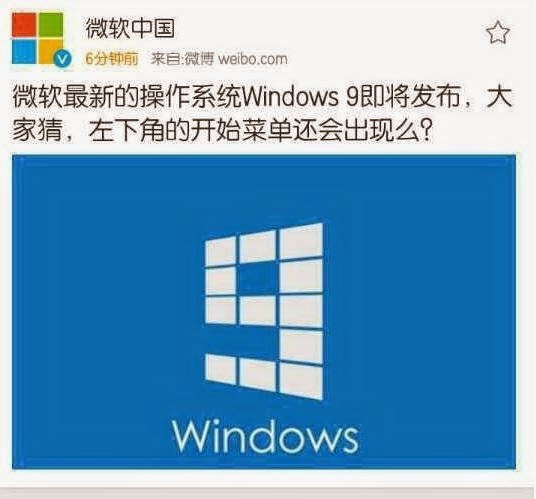 The Chinese subsidiary of Microsoft has just communicated about Windows 9 so probably premature, via the social networking website Weibo. While Microsoft sees ordered by China to explain its antitrust practice and in particular its policy of tying around Windows, the local branch of the American publisher let out, apparently unintentionally, a message and a image (or logo) associated with th e next version of the OS, Windows 9. According to the website the Verge, this post of Microsoft China was published today, and quickly deleted on its page on the social networking website Weibo . the substance of the post said "Windows 9 is coming soon, do you think the Start menu will make a come back in the bottom left." It was not removed fast enough to avoid being spotted by the Chinese website cnBeta. This is not the first leak circulating around Windows 9, the next version known as Threshold operating system. Since late July, we sensed that the Start menu would make a comeback. And since mid-August, he said that a preview of Windows 9 should be provided by Microsoft by the end of September or early October. Including expected the next OS features facilitating its use on non-touch devices, and a Start applications using the design of the mini menu Modern UI interface in conventional windows.